As a professional athlete and the son of a former Major League Baseball player, one might expect Houston Aeros rookie forward Casey Wellman to also be plying his trade with bats and gloves instead of sticks and pucks. Wellman's father, Brad, spent much of the 1980s as an infielder in the majors, hanging up his spikes in 1989 when Casey was barely 2 years old. And while Wellman did give baseball a try in his youth, the speed and excitement of hockey ultimately won him over. "I played baseball, too, but I had quite a bit of energy in me when I was younger," said Wellman, a top prospect of the Minnesota Wild. "Baseball was just a little too slow and boring for me." Perhaps it's no coincidence, then, that speed is one of Wellman's key assets in his bid to join his dad in reaching the top level of their respective sports. "The first thing that's going to jump out at you when you watch Casey play is his speed," said Houston head coach Mike Yeo, who won the 2009 Stanley Cup as an assistant with the Pittsburgh Penguins. "He's got a great skill set, the way he handles the puck in traffic and the speed that he carries it with, and he has a great shot. He's a dynamic player, a pretty exciting player to watch." Despite shuttling a bit between Minnesota and Houston this season, the 23-year-old Wellman has excelled with the Aeros, piling up 11 goals -- including three game-winners -- and 25 points in just 33 AHL contests. He's tied for the team rookie lead in scoring on an Aeros club which enters the last lap of the season just one point out of first place in the AHL's ultra-competitive West Division. "Not knowing that much about him, it's been great to get a chance to work with him to see what a great character kid he is," Yeo said. "His game has risen to another level because of his commitment off the ice and his commitment to learn the game, doing everything he can to get better." A native of Brentwood, Calif., Wellman has employed a strong commitment to growing as a hockey player that dates back to when he was just 11 years old and beginning to consider his options for attending high school. The path he ended up taking was certainly not a traditional one. "When I was about 11 or 12, I got it in my head that I needed to go away to school somewhere if I really wanted to be a hockey player," Wellman said. "I think I was 11 when I told my parents. My mom kind of thought it was a joke, but my dad could see I was pretty serious about it." He applied to a number of private boarding schools on the East Coast and in the Midwest before finally settling on Cranbrook Kingswood in Bloomfield Hills, Mich., about half an hour outside Detroit. "It was a real good experience," he said. "The first few days were tough, but it was something that I really wanted to do, so that got me through it. I think it was a lot harder on my mom, actually." 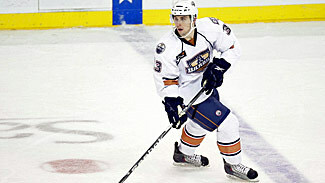 Wellman won a pair of Michigan state hockey titles at Cranbrook before moving on to the United States Hockey League's Cedar Rapids Roughriders, where he was the club's second-leading scorer in 2007-08 with 45 points in 59 contests. From there, Wellman enrolled at the University of Massachusetts-Amherst and spent two years with the Minutemen, including a 2009-10 sophomore campaign which saw him post a team-high 23 goals -- including a program-record 11 on the power play -- and finish second with 45 points. "Going to UMass, I think my game just matured," Wellman said. "I really understood what it was going to take, and the coaches there helped me a lot." Wellman's offensive production as a sophomore -- which saw him become UMass's first 20-goal scorer in eight years -- caught the eye of numerous NHL scouts, and suddenly some 20 teams were expressing interest in signing him. Minnesota general manager Chuck Fletcher traveled to Massachusetts to meet with Wellman, his parents and his agent. Before long, Wellman knew that the Wild offered the best fit among his many suitors. "(We) had all the teams broken down, where they were at, all their depth charts, but the main thing with Minnesota was that I thought I'd get a good opportunity," he said. "Chuck Fletcher, he made it seem like he really wanted me there with the Minnesota organization." Fletcher didn't waste much time in breaking in his latest acquisition, as Wellman appeared in 12 games for the Wild down the stretch in 2009-10 and recorded a goal and an assist. "It all happened really fast," he said. "They flew me in, and I was maybe going to play, maybe not, and ended up taking warm-ups the first game. I finally (played) my first game against Columbus, and while everyone says it's a dream come true, it really was." 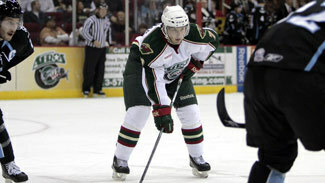 After that whirlwind experience, Wellman headed home to California to begin preparing for his first NHL training camp. That preparation changed course in August when he flew back to St. Paul, Minn., and spent the balance of the summer with the Wild's training staff. "I've always been pretty happy with my summer routine," Wellman said, "but I wanted to show Minnesota that I was a hard worker and that I was willing to do whatever it took to be on the team." Wellman did break camp on the Wild's roster and appeared in 12 games during October and November, but he produced just 1 assist and was ultimately assigned to Houston on Nov. 23. "You don't want to be sent down, so it was difficult at first," Wellman said. "But I think it's important to get to a point where you're not feeling bad for yourself and you're ready to get back on the horse, and try and get better every single day to get back up there." The 6-foot, 186-pound forward took that attitude to heart and immediately began producing in an Aeros uniform. Wellman picked up a point in six of his first eight games after the reassignment and capped that stretch off by tallying four goals in 5-3 win over San Antonio on Dec. 10. It marked his first four-goal performance since the high-school days at Cranbrook. "I feel like I got some confidence again. This is a very good league, and there are great players, but I think the main thing when (Minnesota) sent me down was to get more confidence," Wellman said. "I was able to get some points, and it's been helping my game." Wellman has spent a bulk of time recently playing on a line with eight-time 20-goal scorer Jon DiSalvatore and former AHL rookie of the year Patrick O'Sullivan, and Yeo is watching the rookie flourish as a result. "Certainly, he's one of our key offensive weapons. Whenever we're looking for a goal or an offensive spark, he's a guy that's probably going to be heading over the boards," Yeo said. "If you're playing a team with a strong defensive game, you have to find other ways to create. I think he's done a great job with that. His attention to detail and play away from the puck, he's been able to find himself in better situations, creating more turnovers and using that to his advantage." Like any rookie coming out of college, Wellman has had to adjust not only to the rigors of the pro game itself, but the grind of a demanding schedule which can seem like a marathon, especially at this time of year. "That's not an easy adjustment for any player." Yeo said. "He comes to the rink every day and he's happy to be there, he's got a smile on his face, and he loves what he's doing. I think that gives him the energy needed to go out and be successful. With that, I've seen him grow throughout this year." The growth from September to March has been an eye-opener not only for his coach, but certainly for Wellman as well. With production in the AHL came increased belief in himself -- as Minnesota had originally hoped -- and in turn, Wellman hopes to translate that back to the NHL before too long. "I think the most important thing is just to stay confident," Wellman said. "They sent me here to gain confidence, but in going up to the highest level you have to maintain that because without that, it's difficult. My goal right now is to get better every single day, and I think I've been doing that." "He's a guy that we have a lot of faith in, and we have high expectations for him to be a great player for many years to come for the Minnesota Wild," Yeo said. "He's got the skills, as we said, but I think more important than that, he's got the character and the work ethic. By no means has he reached the limit of his potential right now, but he's on his way and he's got the right attitude towards getting there."